Bill Konigsberg will be at Teen Book Fest on Saturday, Oct. 12 on the Keepin' It Real panel in Meeting Room A at 2pm, and the What We Talk About When We Talk About Love panel in Teen'Scape at 3pm. 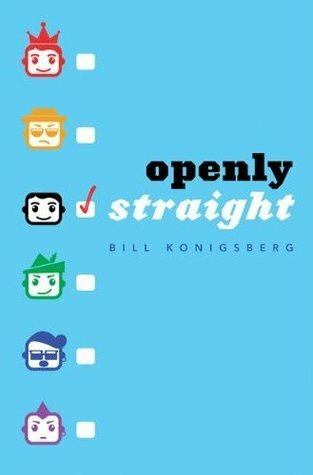 Bill will be signing copies of Openly Straight at 4pm in Meeting Room B. Bill Konigsberg is the Lambda Literary Award-winning author of Out of the Pocket, and most recently, Openly Straight. In Openly Straight, Rafe Goldberg has known he was gay for ages. He came out in middle school. His parents and friends support him, his classmates accept him, he isn’t bullied, he isn’t mistreated…. but he isn’t happy either. When Rafe is accepted at an all-male boarding school, he sees it as a chance to reinvent himself. He doesn’t plan to lie to anyone exactly… he’s just not going to mention that he’s gay. Suddenly, Rafe finds that guys treat him differently when they assume he’s straight. He makes new friends, starts hanging out with a jock crowd, and begins to think his social experiment has been a success - until he meets Ben. Rafe can’t deny his feelings for Ben, but he can’t tell him the truth either. And as their friendship deepens, Rafe finds himself in an impossible situation - if he’s honest with Ben, he might lose him forever. Openly Straight is filled with memorable characters and hilarious dialogue, but it’s also one of the romantic books we’ve read this year. A great read for those who like boarding school stories, books with swoony love interests, and LGBT-themed books. 1. Openly Straight is an unusual twist on a coming out story. What made you want to write a story about a character who is already out, but decides he’s tired of being known as “the gay kid”? I wanted to explore that idea because it was happening to me! I've been openly gay for a long time, and I was beginning to realize how tired I was of always telling people I was gay. Coming out is really a lifelong process, and nobody told me that when I was younger. So I wanted to explore that from a teen's perspective. Talking to teens, they seemed to really understand what I was saying, and I realized I was onto something - an idea that was fresh for exploration, meaning that it really hasn't been written about that much. 2. How would you describe your teenage years, and how much of your memories of life then influence what you write about? AKA How much time did you spend in detention? I would describe my teenage years as tragic. I was really depressed a lot as a teenager. Being gay way back in the 1980s wasn't quite as acceptable as it is today, and as we know, even today it's not always seen as acceptable. My own experiences influence me in that I use a lot of emotional memory in my writing. I definitely know what it feels like to feel different and out of place, and a lot of that comes from being a teenager. Some of my own experiences are also peppered into the story. I just change a few things and bam! there's something from my life, only it's happening to Rafe and not me. There's an apple orchard scene in the book that is based loosely on my teen years. 3. Is there a book you didn't write for which you'd like to write a follow-up, spin-off, or sequel? I adored David Levithan's Two Boys Kissing, and I'd love to write the sequel to find out what happens to each of the kids. 4. What are one or two books that inspired you when you were a teen? What are one or two of the best teen books you've read lately? The first books I read as a teen that made me realize it was okay to be me - not just as a gay kid, but as a sensitive person - were the Tales of the City books by Armistead Maupin. They are probably my favorite series of books in the world. They inspired me as a writer and as a human being. As for today, other than David Levithan's book, which I already mentioned, I'd say my favorite books recently are: the Stupid Fast series by Geoff Herbach, Rapture Practice by Aaron Hartzler, and Proxy by Alex London.